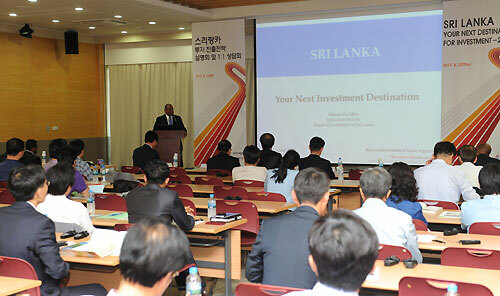 The Embassy of Sri Lanka in Korea in association with the Korea International Trade Association (KITA), which is one of the largest and leading business organizations in Korea, and the Board of Investment of Sri Lanka, held an investor forum dedicated to Sri Lanka on 23 May, 2013. The goal of the forum was to attract prospective Korean investors to Sri Lanka by making them aware of the investment opportunities in the country. Sri Lanka’s Ambassador to Korea, Mr. Tissa Wijeratne, in his opening address, highlighted that the existing bilateral commercial relations between the two countries have yet to reach full potential. Therefore, Korean companies are invited to invest in Sri Lanka at a time when the economy is booming post the three-decade-long ethnic conflict in the country. Mr. Ho-Keun Jang, Executive Managing Director of KITA, also reiterated the importance of Sri Lanka being an emerging market from the perspective of Korean companies and encouraged Korean companies to harness maximum benefits. Korean Ambassador to Sri Lanka, Mr. Jongmoon Choi, also addressed the forum by highlighting the ample business opportunities available in Sri Lanka and detailing the sound macroeconomic situation in the country. Mr. Shivan De Silva, Executive Director (Investment Promotion and Mega Projects) of the Board of Investment of Sri Lanka, gave a comprehensive presentation at the forum covering information about the current Sri Lankan economy, the conducive investment climate and the comparative advantages of investing in Sri Lanka. He also emphasized the investment opportunities in Sri Lanka for Korean companies and invited them to consider Sri Lanka as a key investment destination. 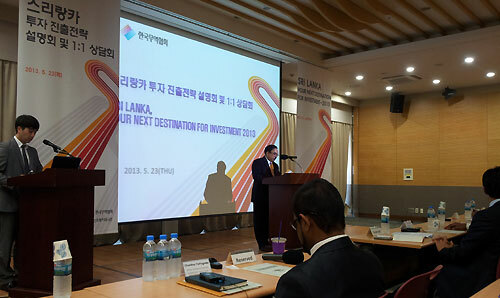 A Korean investor, who has been living in Sri Lanka for more than 17 years, also spoke at the forum underlining his experiences about the investment climate in Sri Lanka, in an effort to boost the confidence of Korean companies gathered at the forum. The forum was successfully held at the COEX in Seoul with the participation of more than 50 Korean companies followed by one-to-one business meetings to discuss their specific interests relating to investing in Sri Lanka.